Mod. Was from the clothing style from the late fifties named so from, the Modern Jazz Musicians. First time, we heard about Mod was from what the, Beatles drummer Ringo said. He was asked, "Are you a Mod or are you a Rocker?" Ringo Star replied, "I'm a Mocker." The Beatles number one hit in the U.K. was, "From Me To You" on May 2nd, 1963. My family and friends had heard my story of the legendary band the, Beatles unexpected arrival in Anchorage on June 27th, 1966. Now, because of that, I decided it was time to write my story. Along with my older sister, Betty and my older brother, Norman, you can read about our unbelievable adventure. So, here is a snippet from my book, "Face To Face With John Lennon." Later that day, Norman and Betty returned to the hotel. They were curious to see what was going on. And the family wanted to make sure I was alright. But I was having such a great time that, time itself had stopped for me. And until Norman and Betty suggested going out for some dinner, I hadn't even realized that I was really hungry. Somewhat reluctantly I agreed to leave the hotel for a short time to get something to eat with my brother and sister. After all, it takes a lot of energy waiting and watching for the Beatles to maybe make an appearance at that window. After a quick dinner we returned to the hotel to see what was going on. Had the Beatles gone to the window and waved at the crowd? If they had while I was gone, boy would I be upset. Then the hotel manager came out and told the crowd to walk over to the front entrance to the hotel. The parking lot was going to be closed. We were startled at first, but while we were walking to the front of the hotel I recognized a black limousine parked in front of the hotel doors. Anchorage,s top officials drove that car around town and in parades. Then the hotel manager came out and made another announcement. The Beatles would be coming out the front doors and down the walk way to the limousine. The Beatles would than be driven to the airport where they would board a plane on their way to Japan. So, everyone was to remain calm and stay behind the velvet ropes. Strangely enough, the crowd of mostly teenage girls remained calm and started talking amongst themselves. Now, let me explain that during this part of the summer in Anchorage, Alaska, we were enjoying Summer Solstice where it doesn't get dark. Night time was as bright as day. And I suppose that's the reason, all of us felt so safe at that late hour. How exciting! The Beatles would be coming right out those front doors. Those very doors that Norman and Betty and I were standing next to. We were mesmerized and didn't care about the time. Oh, my butterflies were back. Then reality mirrored the movies. It was now shortly after midnight but it was as bright as day in front of the Anchorage Westward Hotel. A large group of people of all ages stood behind both sides of the soft luxurious red velvet ropes. And everyone was still calm and quiet as they anticipated seeing the Beatles coming out of the hotel. I could sense the crowd thinking. "How proud we are of ourselves. The Beatles will be walking right by the most behaved crowd in the universe." Then the Security Guard made an announcement. "The Beatles will come out of the hotel through those doors. Then they will pass by all of you and ride this limousine to, The Anchorage International Airport. So, please stay behind the velvet ropes." That is what he said, and we believed him because he was wearing the gray uniform and the gray hat of a trusted, Security Guard. I was still standing with Norman and Betty, very close to the front doors. The excitement and the anticipation of the Beatles was now growing stronger. I thought, "How lucky I was to be standing here so close to the doors. 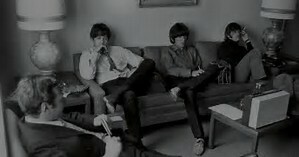 Norman and Betty and I will be the first people in the crowd to see, John, George, Paul and Ringo!" I stretched out my hand to feel the soft luxurious velvet ropes that they so generously placed before us. My stomach was filed with the feeling of more butterflies than I had ever felt in my life. I looked around and noticed the happy faces of the crowd. It wasn't dark at all. We would be able so see the Beatles very clearly. But wait a minute. Suddenly a light bulb went off in my head. 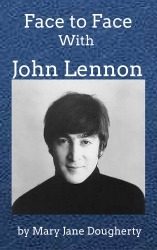 To find out how I came "Face to Face with John Lennon", get your free Face to Face with John Lennon ebook right here on Anchorage Memories. 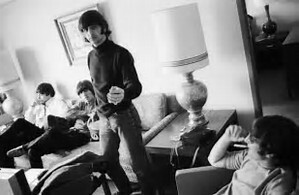 I had just started working at KTVA channel eleven in Anchorage and of course all the local radio and TV stations were covering the Beatles being at the Westward hotel in downtown Anchorage. In the early afternoon on that day I was asked to take some microphone cable down to the Westward for a reporter. When I drove up to the Westward it was a mob scene with Anchorage teenagers everywhere. Little did I know that one of those teens was my future wife Mary. I got out of the car with the microphone cable in my hand and started walking toward the front entrance to the Westward. Suddenly, a member of the Varsity Show crew spotted me and yelled "There's Mike, he can get us in." and a mob of teens started running toward me. I quickly walked through the crowd to the front door of the hotel where I was met by the newsman. He took the microphone cable and I left as quick as I could. Later that night I joined the car caravan that followed the Beatles to Anchorage International airport. Mary, your story is a lot of fun and the surprise ending of your story is amazing.